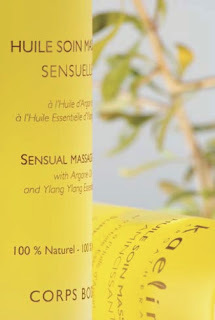 I'm very excited about introducing the Kaeline Argatherapie range to you, which I discovered on my recent trip to Morocco. Kaeline have blended certified organic argan oil (a unique oil only found in Morocco that contains 3 x more of the anti oxidant Vitamin E than any other natural source on the planet) with essential oils for the ultimate skin care treatment. Argan oil is a wonder oil if ever there was one. It's been used traditionally by Moroccan women in their beauty rituals for centuries. Its properties include protecting skin from the environment and ageing, helping to prevent and smooth out wrinkles, preventing stretch marks, reinforcing the skin's lipidic layer for better hydration (it's a great oil for dry skin) and speeding up cell oxygenation for more elastic, soft and supple skin. Plus Kaeline have packaged the products beautifully in elegant glass flasks (the range graces some of Morocco's hippest and most exclusive spas and hotels) which look great on your dressing table and also make the products ideal gifts, especially as the balancing properties of the oil make it suitable for any skin type. how do i get some if that organic oil???? ?